Simply click on a question below to reveal the answer. If you are a researcher, please visit our researchers' page for more FAQs. 1. What is the aim of Join Dementia Research? Join Dementia Research is a national service which allows members of the public to register their interest in taking part in dementia research studies. The service is not a research study itself, but matches interested volunteers with researchers who are seeking participants for their studies. The goal is to make it possible for anyone who wants to be involved in dementia research to get the chance to do so. Every 3.2 minutes someone in the UK develops dementia. There are numerous questions about diagnosis, treatments, prevention, and best care for which there are no clear answers yet. Research into dementia will help find these answers. Scientists have the ideas to tackle dementia, but need people participating in research to help these ideas reach their potential. One of the big difficulties researchers face is finding enough participants for their studies. At the same time, many people are looking for studies to participate in, but don't know where to find them. Join Dementia Research solves this problem by connecting people who want to participate in studies with researchers, to ensure that the right volunteers are matched to the right study. Taking part in research not only helps the researchers but many participants say that getting involved in research can provide a great sense of pride, purpose and meaning as well as hope for the future. 3. Aren't there already enough people taking part in dementia research? Research can only make an impact if there are enough people involved - people who are living with dementia and memory problems, and people who are not. The government and other organisations have increased the amount of funding provided for dementia research, as a result more people are needed to help participate in these new and essential studies. 4. Who has developed the service? Join Dementia Research is a collaborative project, funded by the Department of Health and Social Care, and delivered in partnership by the National Institute for Health Research (NIHR) and the three national Alzheimer's charities: Alzheimer Scotland, Alzheimer's Society and Alzheimer's Research UK. Volunteers of all ages are needed, from all ethnic backgrounds and cultures. Anybody over the age of 18 years old can sign up. 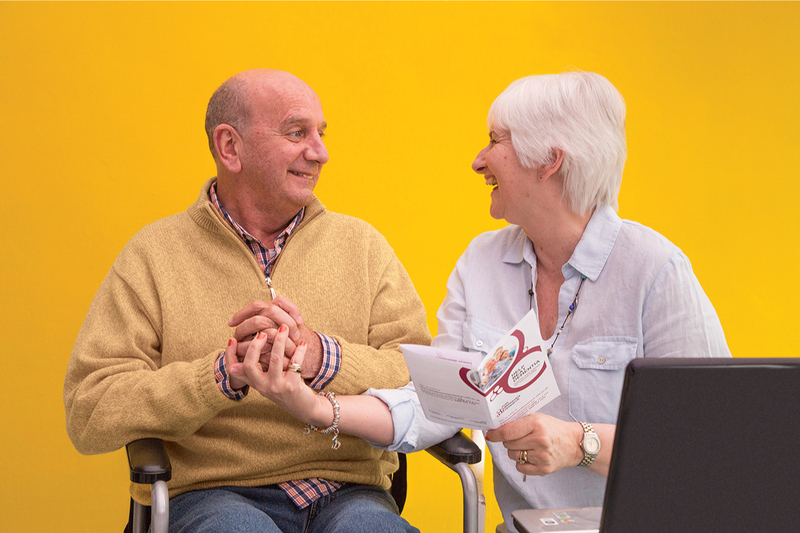 We also encourage carers, relatives and the families of people with dementia to register. 6. I do not have a memory problem or a dementia diagnosis - can I sign up? Yes, anyone who is interested can register with Join Dementia Research. Even though the service is primarily aimed at people with dementia, their carers and family members, some researchers need volunteers without dementia to participate in studies too, for example as ‘control participants’. In clinical research studies, ‘controls’ are people who do not have the disorder being studied. The results from ontrol participants are compared to the results from the group of people who have the condition. A number of studies are also looking for people with experience in caring for a friend or family member with dementia. By registering, you may have the opportunity to take part in some interesting research studies and help advance vital dementia research. 7. Can I join if I have a memory problem, but I don't think I have dementia? We would advise that anyone who has a concern about their memory discusses this with their GP. Becoming forgetful does not necessarily mean that you have dementia. Many of us notice that our memory becomes less reliable as we get older. It can also be a symptom of stress or depression or another medical condition. If you or your GP do not think your memory problem is related to dementia, we would encourage you to sign up to Join Dementia Research as a healthy volunteer. To do this, please answer ‘No’ to the initial question of ‘Do you have a memory problem?’. 8. I’ve seen my GP and am undergoing a memory assessment, can I join? Many people with a memory problem are keen to look for opportunities to take part in research. If you have seen your GP and are currently undergoing memory assessments, we would encourage you to sign up to Join Dementia Research. There is an option to select ‘I am not aware of my diagnosis’ during the registration process. If any of the information you have entered about yourself changes or needs updating, you can either log into your account online to update your own details or alternatively telephone one of our charity helplines who will be able to update your details for you. The more accurate and up to date your information is, the more chance you will have of being matched to a suitable study. 9. By registering, am I committing myself to research? No. Once you have registered your interest, your details will be regularly checked to see if you may be suitable to take part in relevant studies. If a match is found, you will then be contacted in your preferred manner (by phone, email or letter) by a member of the team carrying out the research, who will explain the study to you. At this point, you will have the opportunity to ask as many questions as you like. You can decide on a case-by-case basis whether or not you wish to take part in each study you match to. Your choice will not affect you being registered with Join Dementia Research. 10. How will registering benefit me? Join Dementia Research will help reduce the time it takes to find research studies that interest you. It may will also help you learn more about the research in your local area, region or other parts of the UK. If you do take part in a study, you will have the satisfaction of knowing you could help others and contribute to future insights into dementia and its causes, as well as early diagnosis, better treatment, and quality of care. Many people find being involved in research a rewarding experience and they enjoy the contact with research teams. Some of our volunteers have told us that taking part in research gives them hope for future generations, and makes them feel like they are doing something valuable. Visit the 'Your stories' page to hear about people's experiences and the 'Why sign up?' page for further information. 11. What does it cost to sign up? Join Dementia Research is free to sign up to. 12. Who can see my information in Join Dementia Research? Your information is managed by a team of staff based at the National Institute for Health Research in the Clinical Research Network Coordinating Centre (NIHR CRNCC), working to deliver the service for the Department of Health and Social Care. Only the Join Dementia Research staff at NIHR or agencies working on our behalf, approved researchers, NHS staff and the charity helpdesks registered to use Join Dementia Research will be able to see your information. Approved researchers may be employed by the NHS, commercial organisations or universities, pursuing activities for medical benefit. All researchers are assessed and approved on the basis that their employers are signed up to our terms and conditions, and data processing agreements; and that they are working on ethically approved studies. Researchers only access your information on Join Dementia Research in relation to studies that you match to. View a full list of organisations that are currently recruiting to dementia research studies through Join Dementia Research (updated May 2018). 13. How do you protect my information? Join Dementia Research keeps your personal information private, secure, and confidential. Only Join Dementia Research staff at NIHR or agencies working on our behalf, approved researchers, NHS staff and the charity helpdesks registered to use Join Dementia Research will be able to see your information. The information on Join Dementia Research is held separately from your medical records kept by your GP and/or your hospital consultant. In some cases, a researcher may also wish to view your medical records. The extra details in your medical records will help them to assess whether they should approach you to think about joining a particular study. When signing up to Join Dementia Research, you will be asked for your permission for your medical records to be looked at. Only approved researchers and NHS staff that have been assessed in accordance with “Research in the NHS Human Resource (HR) Good Practice” will be allowed to access your medical records, and those accessing your medical records must follow the NHS Confidentiality Code of Practice and the Data Protection Act 2018. This means that they will only view information from your medical records that is relevant to assess whether you may be suitable to be contacted about a research project, and must keep your information secure. They will not disclose any information from your records to any unauthorised person. Unauthorised disclosure by any researcher of any information from your records is a criminal offence and may lead to their prosecution. If you have questions or concerns, please view our Volunteer Infomation Sheet, our privacy and cookies policy, and our policies and procedures. 14. Is it only for clinical trails? 15. What sort of research could I take part in? Join Dementia Research contains lots of different types of studies that you could take part in. The service is designed to match people with appropriate research studies based on their health information and research interests. There are currently many studies looking for participants across the UK. Current research ranges from clinical trials of new treatments, to surveys about what works in improving quality of life for people with dementia and their carers. For more information, please visit the 'About the service' page. All studies on the service have ethical approval. This means they have been checked to make sure they protect the rights, safety and wellbeing of the people involved. 1. What type of information do I need to provide to register? You will initially be asked a few basic questions about yourself or the person you would like to register. You may want to collect some information to help speed up your registration, such as contact details for your GP and your NHS number. Once you have registered, you can provide further information to improve your matching to studies, e.g. medication information. The information Join Dementia Research collects was agreed in consultation with people living with dementia and their carers, as well as researchers and healthcare professionals. If you have registered as someone with a diagnosis of dementia you may also receive a follow-up call from Alzheimer’s Society helpdesk to check that your record is as complete and accurate as it can be. This will help ensure you are matched to appropriate studies. 2. What basic information is needed to register? If you do have a memory problem, you will also be asked to select your specific diagnosis from a list of options. The more information you provide, the better your chances of matching to suitable studies. 3. How often will I need to log in once I've registered? It is a good idea to log into your Join Dementia Research account regularly to see details about any studies you match to. You can then tick the box to let researchers know if you are interested in taking part in their study. It is really important to make sure your personal details are always up to date. This will allow us to match you with studies more effectively. So if your health or medications change, you move house, or you change your phone number or email address, please update your information as soon as possible. You can log into your online account to make any changes or alternatively, you can call one of our charity helplines who will help you check and update your details. 4. How should I describe my symptoms? Most dementia research studies are looking for particular people. Often this can be based on the severity of someone’s dementia. The person will need more support to help them manage their day-to-day living. They may need frequent reminders or help to eat, wash, dress and use the toilet. They are likely to become increasingly forgetful – particularly of names – and may sometimes repeat the same question or phrase over and over. They may also fail to recognise people or confuse them with others. Loss of memory may become very pronounced, with the person unable to recognise familiar objects or surroundings or even those closest to them, although there may be sudden flashes of recognition. They will need an increasing amount of help with day to day activities and will gradually become more dependent on others for their care needs. They may also become increasingly frail and may start to shuffle or walk unsteadily. Please view 'The progression of Alzheimer's disease and other dementias' on Alzheimer's Society's website, which describes these 3 stages in more detail. 5. How long will it take to sign-up? There are the three steps to register for the service. It should only take about 10 minutes to complete the basic information. Choose a unique username and password, which allows you to easily access your account in the future. Fill in some basic information about yourself. However, we suggest you try to fill in as much information as possible by completing the 'Additional Questions' section (Step 4) too. This is so we can match you more accurately to studies. 6. Do I have to register? No, it is your choice whether you register to Join Dementia Research or not. If you decide that you do want to register, you will be asked to provide your consent. Please do read our Volunteer Information Sheet to find out more. But whether you decide to register or not, it will not affect the standard of the healthcare you receive. Yes. However, we can only register a volunteer with their consent, or the consent of someone who holds lasting power of attorney (LPA) for the volunteer on health and welfare grounds. We will ask you to confirm if you hold an LPA or we will ask to confirm with the volunteer that they are happy to register with Join Dementia Research and for you to act as their representative. If you register by phone or post and you do not hold an LPA, we will only complete the volunteer’s registration if the volunteer has signed the form themselves or if one of our charity helpdesks is able to confirm over the phone that the volunteer agrees to be registered. We recommend that you discuss participation with the participant, where possible. If you intend to act as a representative for someone else, you will need to register yourself as a user or representative and you can then link the profile of the person on whose behalf you are registering, to your account. This is possible through the website or by calling one of the charity helplines. If someone matches to a study and is approached by a research team, full consent will be sought by the researchers before anyone takes part in their study. This means that it would never be possible for someone to become involved in a particular research study without having properly consented. 8. My mother & uncle have dementia. Can I register both of them? Yes. You can register for an account on behalf of two people (with given consent), and complete two sets of information. You can also register yourself under the same account. If you decide to register using a paper form, you will need to complete a separate form for each volunteer. 9. Why do you ask me to about participating in non-dementia studies? Join Dementia Research’s main aim is to help people get involved in dementia studies. However we know that many volunteers are keen to take part in a variety of research to help improve healthcare for all. Sometimes researchers investigating other conditions are looking for participants who don’t have that condition and they add their study to Join Dementia Research. By answering this question when you register, you can let researchers know if you are open to hearing about research opportunities that are not just about dementia. 1. What will happen if I decide to register? Once you have created your account, you will then be asked to provide some personal information. This includes your name, date of birth, contact details and some basic details about your health. Before you give this information you will be asked to provide your consent for it to be used (see Volunteer Information Sheet). The information will help to find studies that might be suitable for you. 2. How will researchers use the information I provide? Researchers can use Join Dementia Research just to see see if there are enough people who could take part in their study before they open the study. This is called a feasibility search. When using it in this way, researchers will only be able to see anonymous data relating to the number of people who fit the requirements of their study. This information does not identify any individual but it helps researchers to know if they are likely to find enough suitable participants through Join Dementia Research. Researchers assigned to a study on the service will be able to see more information about anyone who matches to their study. They can use the service to identify potential volunteers who match their study criteria. Researchers will be able to see the more detailed health and personal information you provided at registration so they can see if you are a definite match. they will also see your contact details so that they can get in touch to talk to you about their study. 3. What if my contact and/or health information has changed? You can update your information at any time, and it’s a good idea to do so as soon as possible so that you can continue to be matched to the right studies and so that researchers can get in touch with you. You can log in using your unique username and password through the website, or call one of the helplines to make these changes. If you have registered on the telephone or via post, you may need to answer some security questions. 4. How long will it be before I’m matched to a study? This will depend on your circumstances. In some cases, there may not immediately be research studies that you are a suitable match for. This can be understandably disheartening for people keen to take part in research. Many studies will require people with a diagnosis of dementia to take part. If you have a diagnosis, it is more likely that researchers will contact you. Some studies involve a group of people with dementia and a group of people without dementia (healthy controls). The control group will need to be made up of people who are the same age as the people with dementia. As dementia mostly affects people over the age of 65, if you fall into that age group you are more likely to be contacted sooner. There will be studies that are interested in finding individuals who care for people with dementia. Although dementia usually affects people over the age of 65, we know that the earliest changes can start to happen a decade or more before symptoms set in. In order to monitor these early changes, people over the age of 40 may be invited to take part in observational studies or research aiming to prevent dementia from developing. If you do not have any memory problems, are not a carer for someone with dementia, and are under 40, there may be fewer studies for which you are eligible to take part. However, some research is concerned with public attitudes towards dementia and this is the kind of research that anybody, regardless of age, can participate in. If you have agreed to travel widely to take part in research, or live in a city where a lot of studies are taking place, you are more likely to be matched to studies. We are working hard to make sure there are studies for everyone on Join Dementia Research. As the service develops there will be many more studies added and, hopefully, something for everyone - regardless of circumstances. Please remember to complete your profile with as much information as possible, and update any changes to your circumstances, to maximise your chances of being recruited to a study. 5. Will I match to studies if I have a memory problem, but no diagnosis? Most studies on Join Dementia Research are looking for either (a) volunteers diagnosed with some form of dementia or mild cognitive impairment or (b) volunteers without dementia. If you told us that you have a memory problem, but no formal dementia diagnosis, you will likely see studies looking for volunteers without dementia. However, we know that there are still a significant number of people in the UK with dementia, who don’t receive a formal diagnosis. This means you may still see studies / be contacted by researchers who are looking for people with dementia. Don’t worry, you will never be enrolled into a study that is unsuitable. The researcher will always conduct a thorough screening, and only enrol those who meet the study requirements. If you do have a memory problem, we strongly recommend you contact your General Practitioner to discuss your concerns. 6. How can I improve my chances of being matched to studies? completing the information from the additional questions on your ‘Volunteer Summary’ page. When you initially register, we only ask a few essential questions. However, after you have completed that initial step and have an account, we recommend that you complete the 'Additional Questions' section to improve your chances of matching to a study. ticking the box to express your interest in studies you match to on your account. indicating your willingness to travel. Some areas of the country may have more dementia research taking place than others. If you are willing to travel, you may be considered to take part in studies in those areas. ensuring the information on your account is always up to date. 1. Why are there no studies in my area? Some areas of the UK have more dementia research taking place than others. However, if you are willing to travel you may be able to take part in more studies. When registering, you can express your preferences and willingness to travel in your personal information. You can also update this at a later date by logging into your account or phoning one of the charity helplines. 2. I received a ‘new study’ match alert email, but can’t see the study. Studies are very dynamic, and the status of a study can quickly change. If you received an email to alert you to a new study, but can’t see the study in your match list, it is possible that the study has either (a) temporarily suspended or permanently closed or (b) that the criteria used to match you (e.g. distance), has changed. This might be due to finding sufficient volunteers, or receiving a good response that will take time to process. Please don’t worry, you may not have missed out. If the study re-opens the study team will still see you, and you will be able to view the study details in your account. 3. How do I manage my account and update my information? If you have an online account you can access and update your information by visiting www.joindementiaresearch.nihr.ac.uk and logging in with your unique username and password. When you are logged in, you will see your ‘Volunteer Summary’ page. Here, you can update or edit your own volunteer information as well as register someone else and maintain their information for them if you have been given their consent or have Lasting Power of Attorney on health and welfare grounds. You can also change how researchers get in touch (for example by phone, letter or email) or sign up for newsletters and updates. If you don’t have an online account, you can update your information by calling one of the helplines, run by our partner charities. 4. I ticked to say I was interested in a study. Why haven't I been contacted? If you tick the box, the research team are aware that you are interested in joining their study. This means they will prioritise you for further checking of your medical records, held by your GP or hospital. If you haven't been contacted it probably means that despite being matched you didn't meet the inclusion criteria, after being checked further. Don't be disheartened, new studies come on to the system every day, so please regularly login and check for your latest matches. 5. What happens if I get matched to a study? If you are matched to a study, this does not necessarily mean you are eligible to take part. Researchers and NHS staff may check your medical records or talk to you to make sure you are suitable for that particular study. If you are eligible, you will be contacted by a healthcare professional or a member of the study team carrying out the research, who will explain the study to you. You can choose whether or not to take part in any research study and your choice will not affect you being registered with Join Dementia Research. You will always be in control. Join Dementia Research will record which studies you take part in. 6. I haven't received confirmation of my registration. If you joined via the website, you should have received an email confirmation. If this hasn't arrived, please check your spam folder. The email did not contain any personal information, so please do not be concerned. You can download your welcome pack from this email. If you joined via one of the Helplines, please allow 14 days for delivery of the welcome pack by post. If your welcome pack still hasn't arrived after 14 days, please contact any of the Helplines and let us know. If you are a representative for another volunteer, ou should have been asked to specify who we can and cannot contact when you registered. Depending on your answers, a confirmation may be sent to both the volunteer and/or yourself as their representative. 7. I forgot my password or username. What do I do? You can request a username reminder, and a password reset from the website. To do this, click the link at the top right-hand corner of the screen, and follow the instructions provided. Please note that when requested to provide your username and email address, it is very important to enter these correctly. For account security, the system will not tell you if you have entered either incorrectly, but if entered incorrectly you will not receive the reset email. If the reset email does not arrive within five minutes, please check your spam folder. If you continue to experience login problems, please contact one of the Helplines, who can confirm your username and issue a password reset. Remember, your username may not be your email address. 1. How will researchers contact me? When you join the service, you can choose how you'd like to be contacted when registering for the service, for example by phone, letter or email. You can change your prefered method of contact at anytime by logging into your account and changing your answer. 2. Who will contact me about relevant research studies? You will either be contacted by a member of your healthcare team or a member of the team carrying out the research, who will explain the study to you. Our approved list of researchers will include those who work within the NHS, Universities or within the commercial organisations. The list below confirms the only commercial organisations approved to use Join Dementia Research. If you have registered as someone with a diagnosis of dementia you may receive a follow-up call from Alzheimer’s Society helpdesk to check that your record is as complete and accurate as it can be. This will help ensure you are matched to appropriate studies. 3. Could I be contacted by more than one research team? Yes, you could be contacted by more than one study team. Join Dementia Research will also record which studies you take part in. 4. When will I start to hear from researchers? This will vary from person to person, as it will depend on which studies are currently open and which people they are looking to take part. After registration, For some people it may take some time before they are contacted by a researcher. However, it is important you keep your personal information up-to-date. The more current information you can provide, the easier it will be for researchers to find out whether you can participate in their study. 5. Will I definitely be contacted about participating in a study? In some cases, there may not immediately be research studies that you are a suitable match for. This can be understandably disheartening for people keen to take part in research. However, having a nationwide service means that studies can be started much more quickly, and new studies are starting all the time. Just by signing up you are already helping, by supporting researchers to design future research around those who are interested in taking part, and by ensuring certain areas of the country become more research active. 1. Am I obliged to participate in a research study if I sign up? No, you will never have to participate in a study unless you decide it is the right thing for you. Choosing to get involved in research is an important personal decision and there are different reasons why a study may or may not be one you want to take part in. It is also important to discuss the possible advantages and disadvantages with a doctor or nurse. 2. I don't want to join a study. Can I still help? Yes. There are lots of ways to help research. You may be interested, for example, in shaping research questions or raising awareness of research. Please visit getting involved in research in other ways. You can also help the national dementia charities with their dementia research programme. For example, you can sign up to become a member of the Alzheimer's Society's Research Network, the Alzheimer Scotland volunteer group or contact Alzheimer's Research UK and help them decide which research projects to support. 3. If I hold Lasting Power of Attorney, can I consent someone into a study? Yes, generally. Research studies have procedures covering how they can enroll people who lack capacity. If you hold a Lasting Power of Attorney (LPA) on Health and Welfare grounds, you can take a decision for someone with dementia who lacks capacity, in accordance with the person's best interests. Make sure researchers and staff in the healthcare team know you hold an LPA. 1. How do I change which emails I receive from Join Dementia Research? It’s up to you how you choose to hear from us. You can use your account to manage your settings, and you can change your settings at any time. Read our step by step guidance on how you can make changes yourself. Alternatively, contact our partner charity helplines who can make these changes on your behalf. 2. How do I remove myself from Join Dementia Research? Research, please either contact the Join Dementia Research team (see details below) or contact the Helplines. Your personal information will be kept in the form of an anonymous record that cannot be traced to you personally. You will not then be contacted about any further studies that use Join Dementia Research. If you have participated in a research study, or have given your details separately to a research team, you may still receive their communications. 3. What happens when I ask for my personal information to be deleted? When a volunteer/user account is deleted from the Join Dementia Research website, this account and all the information recorded in it (e.g. personal data, healthcare data, and comments) is permanently removed from the database. This means that no registered clinician or researcher user accessing Join Dementia Research can see your information. You will no longer be able to access your account and will not be contacted or matched to research studies. Despite the deletion of a user account, an audit log retains a record of your previous web history and the information you provided. This will be kept for up to 38 months, and is kept for investigatory purposes only (i.e. if Join Dementia Research receives a complaint or there is a report of suspected suspicious practice). This is to ensure that we can trace back all changes made to any account. Access to the audit log is restricted to the Join Dementia Research Register Manager. A record of all investigations is maintained. Information in the audit log cannot be used or restored to create another account. Where a volunteer participates in a study, their information will be held by that study team, and will be kept in accordance with the relevant legislation. Withdrawing from Join Dementia Research will not affect any existing research studies you have chosen to join or the standard of healthcare you receive. You also have the right to full deletion of any data we hold on you, which is a more thorough process than withdrawal from Join Dementia Research. Please visit our policies and procedures for a copy of the full Data Destruction Policy. 4. What can I do if I have more questions? For general questions or comments, please visit the contact us page. Your suggestions about how we can improve this resource for you are always welcome! 5. I want to tell others about Join Dementia Research - what can I do? That’s fantastic - thank you. The success of Join Dementia Research relies on as many people as possible know about the service and registering their interest in taking part in research. Ask local organisations to display our materials. They are free to order here and slides can be downloaded and displayed on TV screens in waiting rooms. If you’re a healthcare professional, check out our toolkit for more ideas about what you can do. 6. Are Join Dementia Research materials available in other languages? Yes. You can request Join Dementia Research materials in Welsh by contacting comms.jdr@nihr.ac.uk. 7. How are clinical trials regulated? All research studies sourcing volunteers through Join Dementia Research have ethical approval from an ethics committee or the Health Research Authority. Drug trials will have been reviewed and approved by the Medicines & Healthcare products Regulatory Agency. For further information on how clinical studies are managed in the UK please visit NHS Choices' webpage. 8. I've heard about Amyloid Plaques. What are they? The hallmark of Alzheimer's disease is development of plaques and tangles of certain proteins in the brain. The plaques, sometimes called clumps, are made up of a form of protein called amyloid. Amyloid is formed when a larger protein, called Amyloid Precursor Protein (APP), are broken down into smaller pieces. Some people who have participated in clinical trials may have undergone a positron emission tomography (PET) scan as part of their involvement in the study and, as a result of this, may have been provided with information on whether the scan revealed the presence of amyloid plaques in their brain. Professor John O'Brien explains more about Amyloid Plaques in this video. 9. How is APOE testing currently used? APOE testing is not routinely available on the NHS, as some people may have the APOE4 gene and still never develop the disease. However, some people may be aware of whether they have it if they have taken a private genetic test or been told as part of a previous research study. Currently, APOE testing can be used in research settings to identify people who may have an increased genetic risk of developing Alzheimer's – these people carry a version of the gene called APOE4. This knowledge helps researchers look for early brain changes in study volunteers and compare the effectiveness of treatments for people with different versions of the APOE gene. Some researchers believe that APOE testing is useful for studying Alzheimer's disease risk in large groups of people, but not for determining any one person's risk. You can read more about APOE on the Alzheimer's Society website.